If you happen to be in Western Massachusetts this month, you may want to stop by one of my favorite art museums, the Sterling and Francine Clark Art Institute, in Williamstown. It’s a beautiful museum in a beautiful setting, whose permanent collection I never get tired of looking at. But their exhibitions are quite fine, too. Until 27 March, they’re showing Eye to Eye: European Portraits 1450-1850. You can read a review in the Wall Street Journal. A little further east, the Worcester Art Museum has organized an exhibition of portrait miniatures. Dandies runs through May 2011. Then it’s on to the women—French women, to be exact. Leisure, Pleasure, and the Birth of the Modern French Woman runs 14 May-11 September. 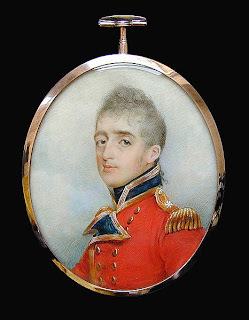 Illustration: Portrait miniature of Lt-Col. Stephen Peacocke painted by George Chinnery around late 1779/1800, courtesy Wikimedia Commons.